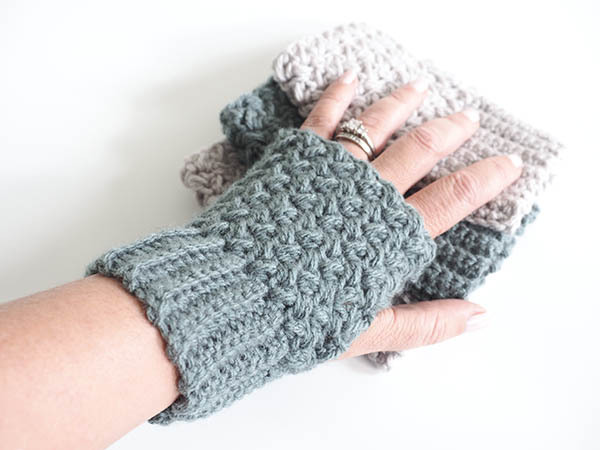 These gloves are functionally comfortable; the aligned cobble stitch pattern adds a layer of warmth on those cold winter days without adding too much bulk. I also love that my fingers are free for texting and responding to emails while I’m out and about. This pattern can be worked in two different sizes, with an option to add additional stitches to customize the fit. I was feeling brave and decided to make a matching pair for myself and my preteen daughter. I survived with minimal eye-rolls and even got a little smile (she secretly still thinks it’s cool to have matching things). Pattern details: Ladies size is in brackets, for wider gloves add in multiples of 2 to the pattern. Aligned Cobble Stitch is worked in rows of 2, watch for turning. The wrist portion of these gloves are worked in the round, use a stitch marker. Optional – Add a few buttons for a pop of color! Click here to purchase an ad-free printable PDF of this pattern for your convenience. This PDF pattern also comes with a with a bonus crochet tips and tricks pdf.